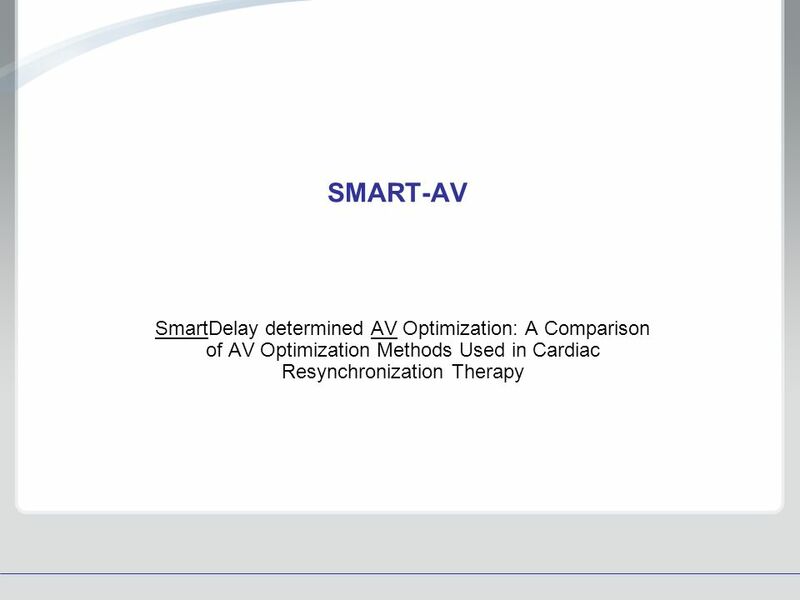 SMART-AV SmartDelay determined AV Optimization: A Comparison of AV Optimization Methods Used in Cardiac Resynchronization Therapy. Boston Scientific develops, manufactures and markets a broad array of products and services that enable less-invasive care for some of the most threatening cardiac conditions. Its prescription devices for use by healthcare professionals are regulated by government agencies in each of the countries in which it does business, such as the Food and Drug Administration in the United States (U.S.) or the Ministry of Health in Japan. These regulations often restrict the use of the information that can be disclosed to the public. 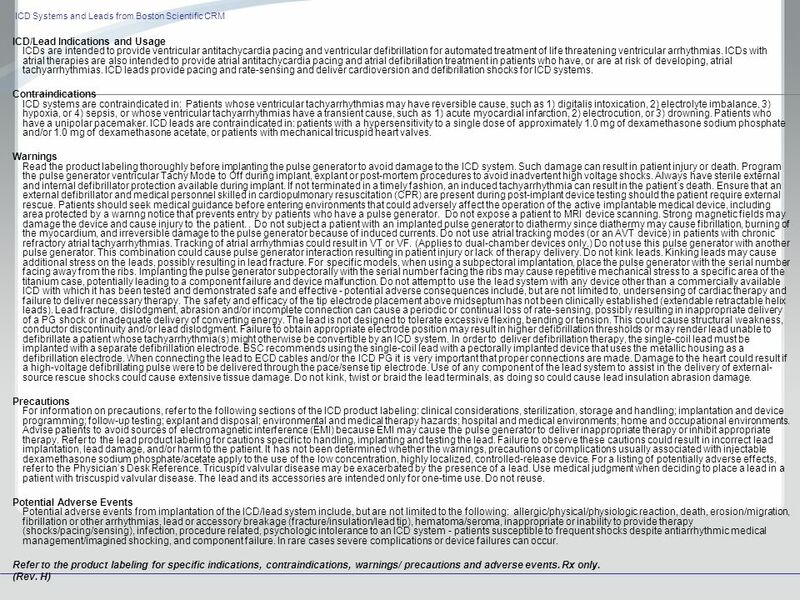 If the format of the material presented is altered, the appropriate indications, contraindications, precautions, warnings and adverse events should be included. This Presentation has been developed as a service of Boston Scientific. Like any other service, in spite of our best efforts the information in this Presentation may become out of date over time. Nothing on this Presentation should be construed as the giving of advice or the making of a recommendation and it should not be relied on as the basis for any decision or action. The materials on this Web Site are intended for educational purposes only. 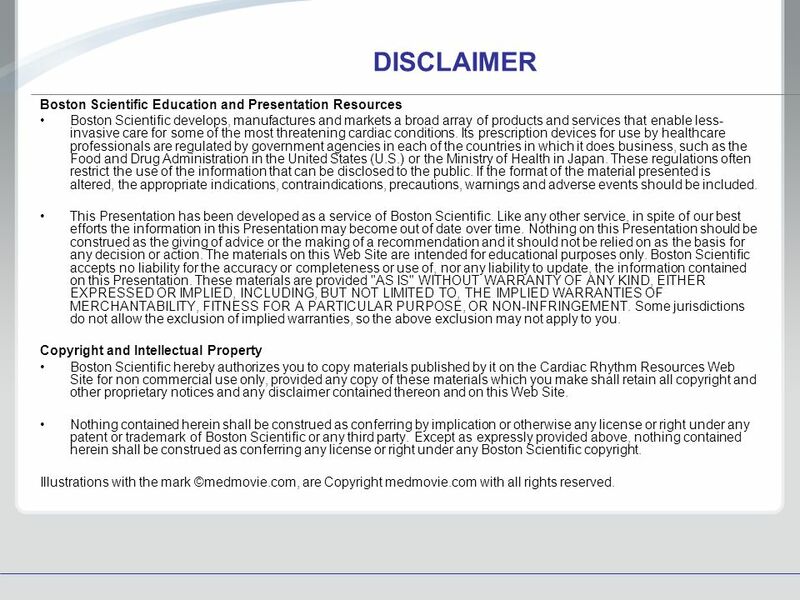 Boston Scientific accepts no liability for the accuracy or completeness or use of, nor any liability to update, the information contained on this Presentation. These materials are provided "AS IS" WITHOUT WARRANTY OF ANY KIND, EITHER EXPRESSED OR IMPLIED, INCLUDING, BUT NOT LIMITED TO, THE IMPLIED WARRANTIES OF MERCHANTABILITY, FITNESS FOR A PARTICULAR PURPOSE, OR NON-INFRINGEMENT. Some jurisdictions do not allow the exclusion of implied warranties, so the above exclusion may not apply to you. Copyright and Intellectual Property Boston Scientific hereby authorizes you to copy materials published by it on the Cardiac Rhythm Resources Web Site for non commercial use only, provided any copy of these materials which you make shall retain all copyright and other proprietary notices and any disclaimer contained thereon and on this Web Site. 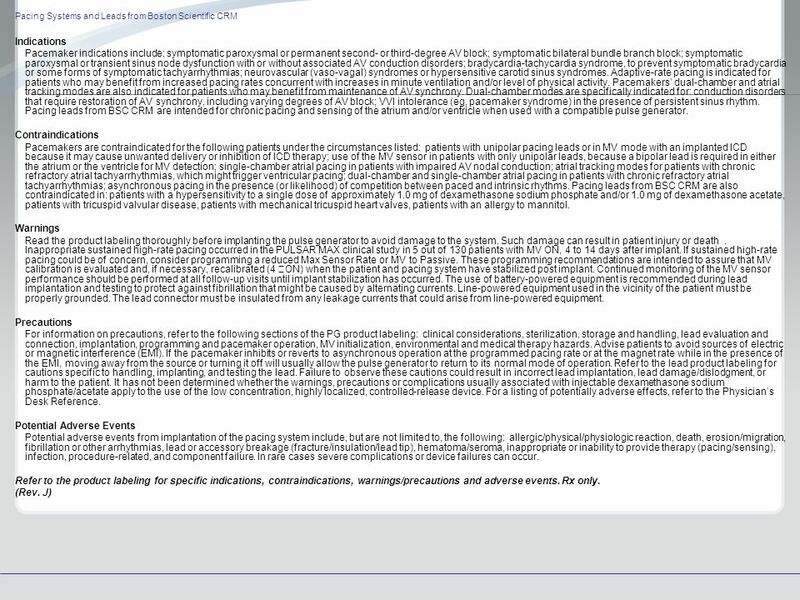 Nothing contained herein shall be construed as conferring by implication or otherwise any license or right under any patent or trademark of Boston Scientific or any third party. Except as expressly provided above, nothing contained herein shall be construed as conferring any license or right under any Boston Scientific copyright. Illustrations with the mark ©medmovie.com, are Copyright medmovie.com with all rights reserved. 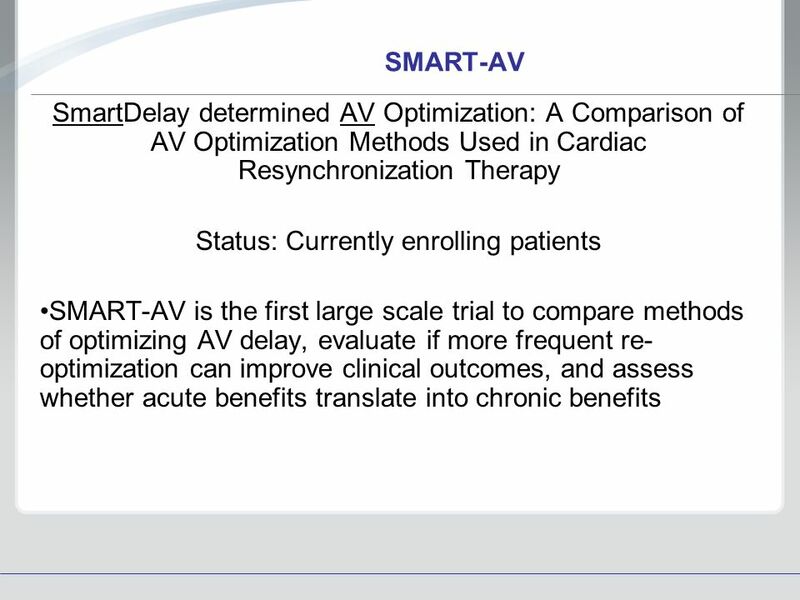 SMART-AV SmartDelay determined AV Optimization: A Comparison of AV Optimization Methods Used in Cardiac Resynchronization Therapy Status: Currently enrolling patients SMART-AV is the first large scale trial to compare methods of optimizing AV delay, evaluate if more frequent re-optimization can improve clinical outcomes, and assess whether acute benefits translate into chronic benefits Study name from protocol. Current status from the study team’s status report. First is new content previously unapproved. It has been reviewed by Tim Meyer (study scientist) and determined accurate. It is also supported by the previously approved study summary, protocol and interest visit slides, which review study background to establish the rationale for conducting it. 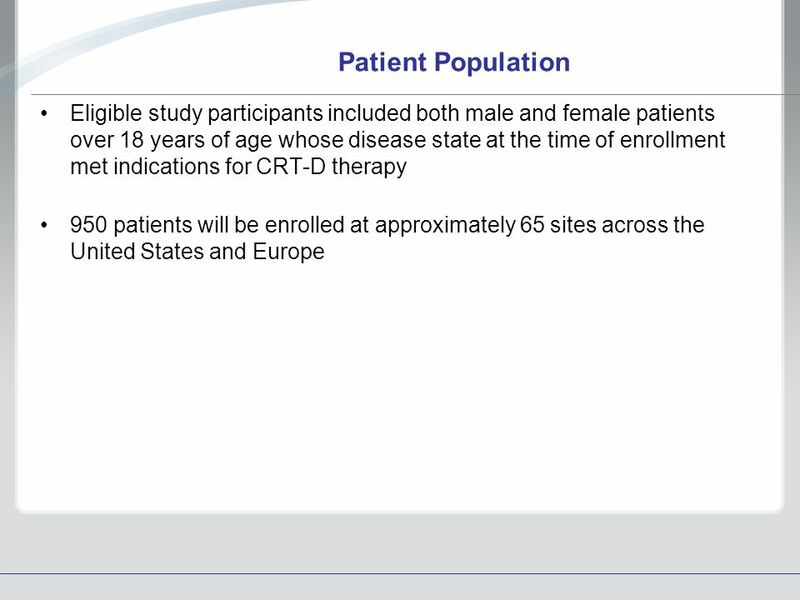 5 Patient Population Eligible study participants included both male and female patients over 18 years of age whose disease state at the time of enrollment met indications for CRT-D therapy 950 patients will be enrolled at approximately 65 sites across the United States and Europe Pulled from the study protocol and summary. Also reviewed by Tim Meyer (study scientist). 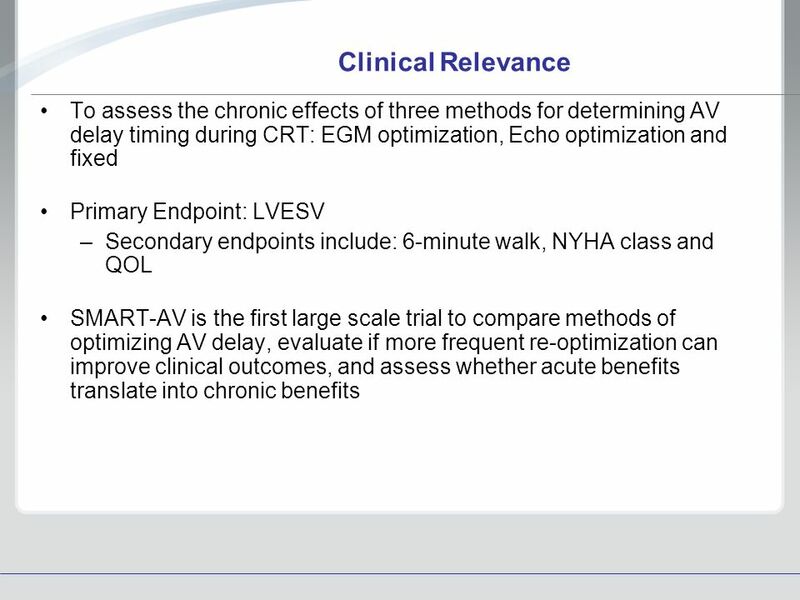 6 Clinical Relevance To assess the chronic effects of three methods for determining AV delay timing during CRT: EGM optimization, Echo optimization and fixed Primary Endpoint: LVESV Secondary endpoints include: 6-minute walk, NYHA class and QOL SMART-AV is the first large scale trial to compare methods of optimizing AV delay, evaluate if more frequent re-optimization can improve clinical outcomes, and assess whether acute benefits translate into chronic benefits Pulled from study protocol and background slides. Also reviewed by Tim Meyer (study scientist). 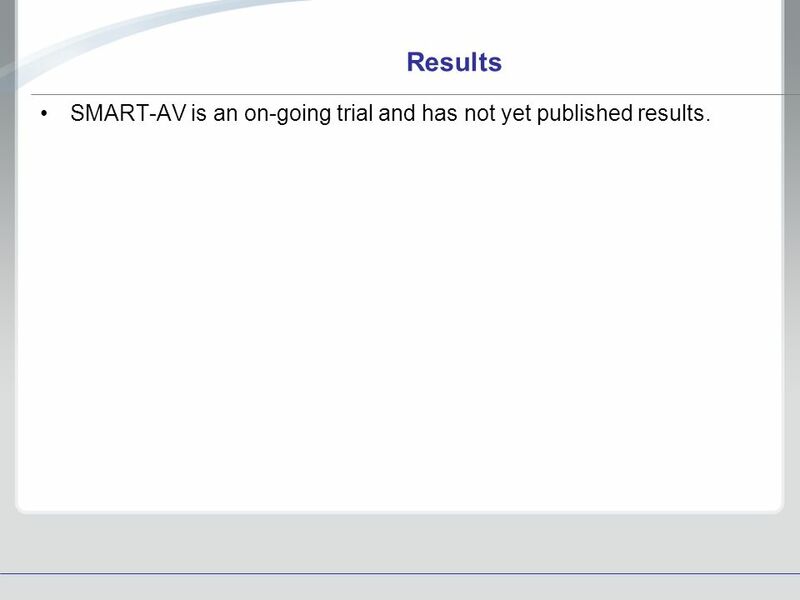 7 Results SMART-AV is an on-going trial and has not yet published results. 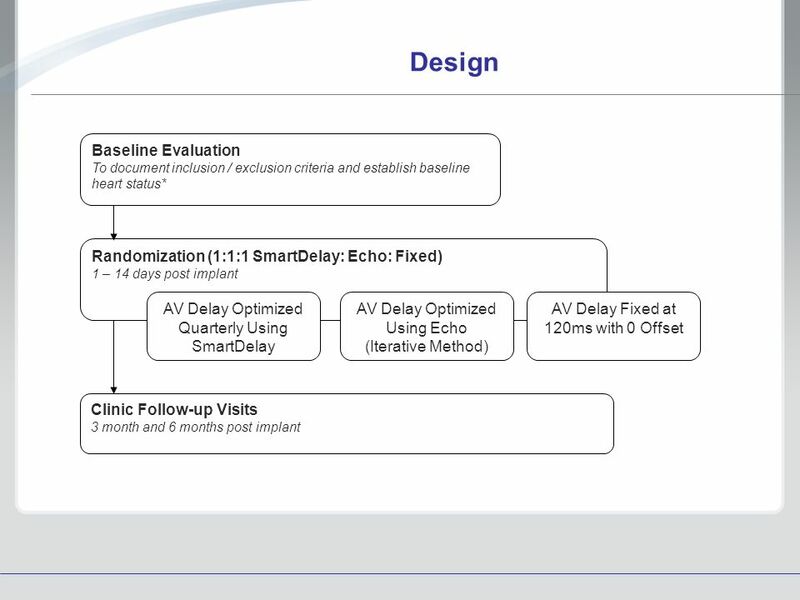 Download ppt "SMART-AV SmartDelay determined AV Optimization: A Comparison of AV Optimization Methods Used in Cardiac Resynchronization Therapy." Appendix E Pacemakers Gail Walraven, Basic Arrhythmias, Seventh Edition ©2011 by Pearson Education, Inc., Upper Saddle River, NJ. RAPID-RF Remote Active Monitoring in Patients with Heart Failure Status: Completed in 2008. 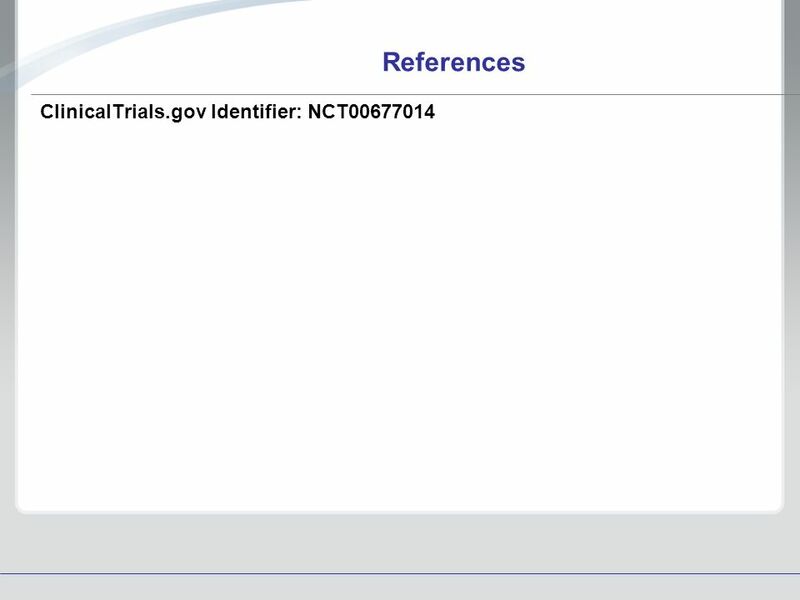 Clinical Trial for Cardiac Ablation for Type I Atrial Flutter. CARE OF PATIENT ON PACEMAKER. WHAT IS A PACEMAKER? - A cardiac pacemaker is an electronic device that delivers direct stimulation of the heart. EP Testing and Use of Devices in Heart Failure HFSA 2010 Recommendations. Post Research Benefits Mandika Wijeyaratne MS, MD, FRCS Dept. of Surgery, Colombo. 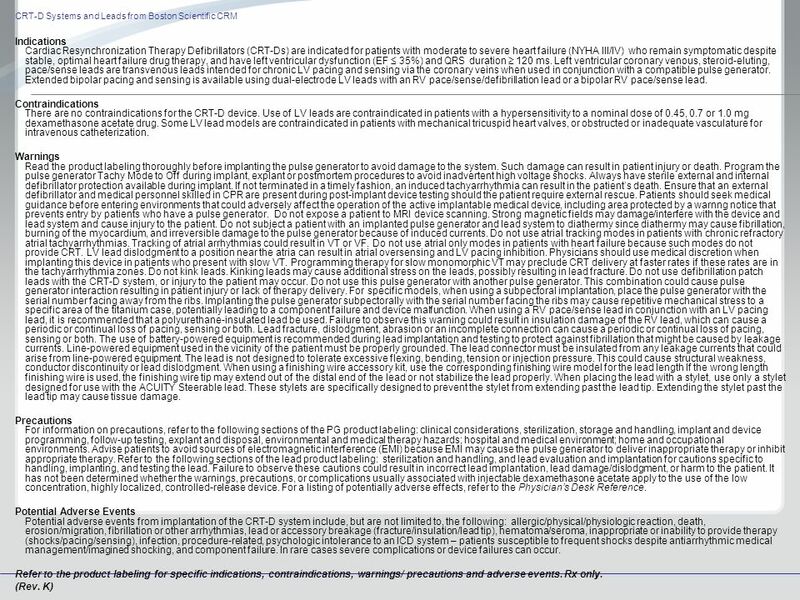 Early CRT Intervention Reduces Death and Heart Failure Events : Updated Insight from MADIT-CRT Multicenter Automatic Defibrillator Implantation Trial. The Very Basics of Pacing Glenn Estell Medtronic Pribcipal Clinical Specialist. APPROPRIATE Assessment of Proper Physiologic Response with Rate Adaptive Pacing Driven by Minute Ventilation or Accelerometer.